Broad Run is not a Golf Club; it’s a Golfer’s Club. That’s part of the golf course’s official name. With the club’s new management already making course playability and member involvement a priority, the name may ring truer than ever. 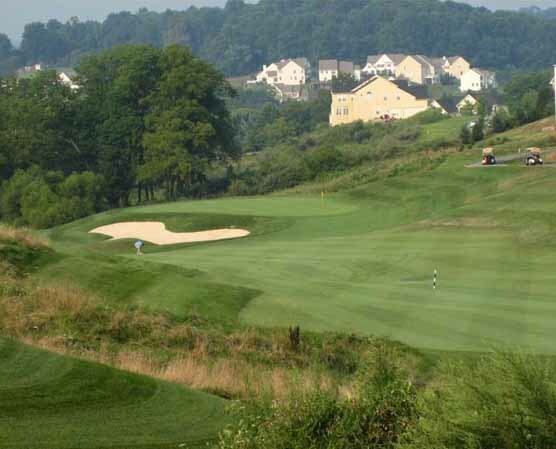 The club, located outside West Chester, was taken over on May 3rd by Jonathan Byler, who also owns Iron Valley GC in Lebanon, among other properties. He immediately recruited local talent for a number of key posts in the management to foster a more welcoming community atmosphere. Head pro Pete Lovenguth and General Manager Jeff Broadbelt both came over from Downingtown County Club. Superintendent Chad Rightmyer left French Creek in Elverson, to join Broad Run, and Chef Jamie Nafe left his post as Executive Chef of the Zagat-rated Firecreek Restaurant in Downingtown to return the Bordley House Grille to its former status as a destination restaurant, not only for apr�s-golf. Steve Ekovich, Director of Golf and Resort Properties Group of the National Golf Group, who brokered the deal, recalls how the course had about a dozen different GMs during its first 12 years of existence. Broad Run began life in 2000 as Tattersall Golf Club near the height of the golf course building boom. When the most recent owners, a private equity firm, filed for bankruptcy protection, about eight offers were made on the property. New owner Byler and the staff are already bringing a more stable environment for both employees and players. For faster play, they've cut back the longer fescue grass and deeper areas of rough. It’s not rocket science to realize that fewer lost balls equals faster play, which has sometimes been an elusive goal at Broad Run. "We're trying to make the course a little more golfer-friendly," said Lovenguth. Broad Run is not a walking course. It’s cart-only, and drives from greens to tees add a solid 15 minutes to the round as it is. There’s a good reason you need a cart. The course goes up and down the 130 feet of elevation several times over the 370 acres. But the holes are mostly impressive and worth the time if you have it to spare. The course was designed by Rees Jones, widely known for many years as the "U.S. Open Doctor." He was the man responsible for lengthening and ratcheting up the difficulty on many classic courses so that the USGA could defend par against advancing modern technology. You get the feeling he was trying to do a similar thing at Broad Run. The nerve-testing first hole sets the tone for the entire round. It’s the first of several yo-yo holes that go from elevated tee to low valley to elevated green. It’s an impressive hole, framed nicely on all sides by natural wetland growth in a wide array of earthy shades. A short-par five, it begs the golfer to treat it like a long par-four. But if you bite off more than you can chew, the first of many very deep bunkers guards the left side of the green to corral your early-round optimism in a heartbeat. Truth be told, there are some forgiving aspects of Broad Run. On a handful of holes you can overcook your draw, even to a hook, and have a sideboard that kicks it back onto the fairway. The G2 Bent greens are kept near perfection and are not severely undulating. So much so that if you miss a four-footer, you have no one to blame but yourself. And you almost never face a long putt dreading that a three-putt is the most likely outcome. If you're included to slice, however, it could be a long day, and if you're expecting to pad your driving distance stats, call it a practice round. There are many drive landing areas that are uphill, allowing for almost no roll. In addition, expect a number of approach shots where you can't see the surface of the green. If all these things could possibly get under your skin, make a habit of hitting more club than you think you need and you’ll often be right on the money for the center of the green. Just when you think you’ve had enough of blind shots, however, you get the exact opposite. The par-three 17th drops over 100 feet from tee to green, which translates into almost three less clubs for the distance. Lovenguth explains that the staff is working on improvements all-around, because it’s often attention to detail on the little things that make or break an enjoyable day, and the results can be cumulative. For instance, they’ve repaired broken bunker faces on the steep green slide slopes and plan to remove those eyesore string fences that guide carts. After all, there are many other ways to signal where carts can enter and leave the fairway. Lovenguth realizes that many players don’t play the best set of tees for their ability, which can lead to unnecessary frustrations. But, as mentioned above, the course plays longer than its yardage pretty much all the way around. The "Tattersall" tips measure over 6,800 yards with a 72.8/136 rating and slope, the "Bordley" tees total 6,400 yards (70.9/132) and the "Broad Run" tees are 6,000 yards (68.8/127). For the standard weekday rate of $56, you get a lot of golf course, an interesting variety of holes, grand vistas and a thorough test of golf. Weekends top out at $75, and there are tiered twilight rates all seven days. Lovenguth is unapologetic about the difficulty of the course if you step back to a tee box that will test your resolve. "The course will let you know where you stand as a golfer," he assures. "We want good players to come out here and know they have a challenge." I love this course! It has a big feel to it and you feel like you played a big course when your round is finished. Well managed and cared for with a friendly, polite staff. New management has the course in its’ best condition in years. Greens were impeccable and rolling well. Broad Run has been restored to "must play" status.